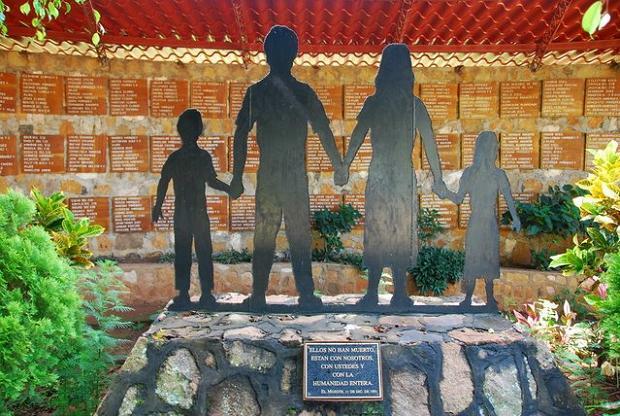 To mark the 30th anniversary of the atrocious El Mozote massacre of 10 Dec 1981 – at the onset of a bloody civil war (1980-1992) which resulted in the deaths of more than 70,000 people in total –, a ceremonywas held in El Mazote on Saturday, attended by El Salvador’s Foreign Minister, Hugo Martínez. Martínez said the event sought to ‘honour the memory of hundreds of innocent people who were murdered 30 years ago here in El Mozote and in nearby towns’, with the statesman also asking forgiveness for what he called the ‘blindness of state violence’ . Between 10-11 December 1981, members of the US-trained Atlacatl, an anti-guerilla elite battalion headed an incursion into El Mozote following suspicions of collaboration between the villagers and anti-government rebel forces. According to a report by Archdiocesan human rights group Tutela Legal, an estimated 393 people were brutally tortured, raped and killed, including men, women and mostly children (their bodies and houses burned after the killings), although the total death toll is placed at 794 when including military operations in nearby towns which took place between 10-13 December. 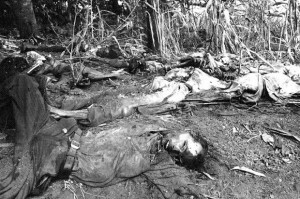 A 1992 report by Human Rights Watch describes El Mozote as “probably the largest mass killing reported during the war” (p. 3). The United States’ involvement in the civil conflict and specifically in the El Mozote massacre grants a certain amount of legitimacy to Simón Bolívar’s assertion that the “United States [seems] destined to plague and torment the continent in the name of freedom” (1829). For, much like in Honduras, Nicaragua and Guatemala, both the Carter and Reagan administrations offered training as well as extensive funding and armament to security forces in fear of losing the government to what was described – along Kessingerian lines – as the spread of the virus of ‘communist terrorism’. In truth, the real fear – and for good reason – amounted to the possibility of the spread of a virus, indeed, but that of establishing a democracy in El Salvador – much like in Chile under Salvador Allende – that would further the welfare of the majority of its own people, instead of privileging corporate and foreign interests. This ‘rotten apple’ might give other countries in the region and elsewhere the wrong kind of ideas. Lieutenant Colonel Domingo Monterrosa was the founding commander of the Atlacatl Batallion (1980), after serving in the army for several years and completing a course at the US Army’s infamous (and still operational) School of Americas (SOA) in 1966, at a time when the school was located in Panamá. The US-trained SOA graduate later confessed to having organised and participated in the El Mozote massacre during an interview with reporter James LeMoyne in which he is heard saying: “Yeah, we did it. We killed everyone. In those days I thought that was what we had to do to win the war. I was wrong”. In his Turning The Tide (p. 122), Noam Chomsky highlights that in March 1984 “it was revealed publicly that US planes were rapidly increasing reconnaissance to provide intelligence for what the government and the press call “military operations””, which included “ground sweeps and massacres [of civilians] by US-trained elite units”. According to a forensic investigation into El Mozote conducted after the 1992 peace accords, “the cases were all fired in a 5.56 mm NATO-caliber firearm” and “appear to have been fired in United States M-16 military rifles”. This week’s commemorations, nonetheless, serve as a stark and necessary reminder of the devastating impact US foreign policy has had on the region over the past few decades. It remains to be seen whether US involvement in El Salvador’s civil war would ever be brought to justice, but if the region’s move away from American influence over the past few years is any guide, the verdict of history has already been delivered. During my years as the first representative for Swedish Save The Children in Central America 1982-1985 I was forced to se, to know and to understand “The US terror in the region”. The brutal war against the peoples of the region, the church, the Jesuits….all was supervised by Ambassador John Negroponte in Honduras. (AKA Nekroponte). The planning from the group behind PNAC (Project for a New American Century) released “The Salvadorean Option” in Irak with expert assistance from John Negroponte. Esquadrones de la muerte is now spreading from “The School of Americas” to all parts of the world. We have to watch closely the new regime in Guatemala. There we may se a new wave of killings in the country a BBC film named “Killers Paradise”.